Now that I had emergency snacks taken care of, I wanted to have emergency drinks handy as well. Although I store bottled water beneath a bed, there are times where something slightly more interesting to drink than water would be helpful, especially if people are suffering from electrolyte imbalances. So I began collecting the same sort of pencil boxes that my Insta-Eat kits are packed in, and used them to build Insta-Drink kits. As long as I have potable water and a Coleman camp stove available, I'll be able to whip up hot nourishing drinks in a jiffy. 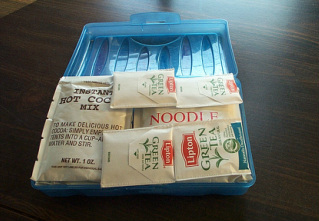 I packed hot chocolate mixes, soup mix, tea, and bouillon cubes. Into a single container I managed to fit 6 cups of cocoa, ten cups of tea, 20 cups of bouillon, and 8 cups of chicken noodle soup. 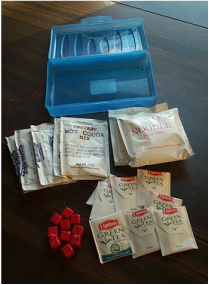 I crammed in as many individual sugar packets and honey sticks as I could fit, then sealed it closed with duct tape and stored a stack of these instant beverage kits along side my instant snack kits.